I can't beleive it as been one year since Elizabeth entered my life, I also can't beleive how much she asp changed me and my life! We all hear how having a child changes you, well its true. I think now i'm more serious and look out for someone other than myself. She gives me alot in return and asks for very little. 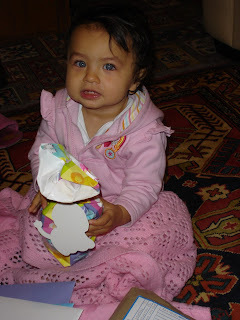 We got her up at around 6am and gave her the presents people had sent her plus our presents. Like a typical baby she was more interested in the wrapping and packaging than the actual present. As you can see from the picture she is super happy. We went to see my Mum and Alan who where up at their caravan, so we had a leisurely drive up to Brid. The weather to start with was foul. When we got there my Mum made us a cup of coffee and we settled in for the day. that was until Elizabeth climbong over Nuch spilt the whole cup of boiling coffee over her legs. We quickly pulled her jeans off and put her legs under a cold tap. Her legs were red, but the jeans had taken the brunt of the heat, Elizabeth was more pissed off about the cold water. After a lovely tea we had a walk on the beach and headed home. next year we'll have a big party for her. 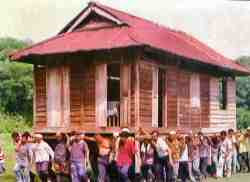 For the third time this year wer'e moving home, getting boring! 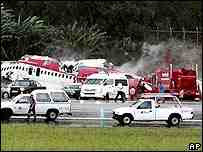 Today a 1-2-Go airliner crashed on approach to Phuket Airport. 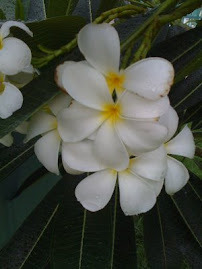 The conditions were said to be terrible, with near typhoon conditions. First reports are that over 80 people have died including several brits. I know how hard some of these storms can be, its almost like a near sheet of water coming down. Hopefully it wasn't pilot error, these are the rumours flying round at the moment. I'm not talking about the brilliant Alfred Hitchcock thriller, but the way someone can change in the matter of a few weeks into a raving lunatic. My ex Boss, I wont name him but you know who I mean! as turned into said Psycho. I had a call from one of my next door neighbours who showed me a letter someone had sent anomynously (Coward) explaining that I was tapping into my next door neighbours wi-fi signal! The following day another neighbour came round and informed me he had contacted the Police on the basis of the letter. I know it was my looser, coward, psycho, ladyboy loving ex-boss because the spelling and grammar on the letter where up to his usual standard (Shite) and the envelope was the same as the letter he had sent me the same day informing me that he was illegally with holding my salary until he had received back the deposit he had lent me for the house. Someone I know confronted him, but he denied it. several other things have happened since this (he as a reputation as a serial stalker) and once the law as taken its time i'll be at liberty too name names and publish photos and stories that might not go down to well. The looser, coward psycho as woken a darker side of me. Things might take a few months, but REVENGE is a dish best served cold!!!! !